A list of all published programs can be viewed in the projects. The category "bits and pieces" won't get you bored. For students and pupils with a firm schedule and a PPC or PDA based on windows mobile 5 or 6 / pocket pc 2002, 2003 the software Help! could be interesting. 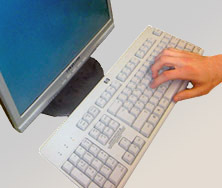 The program delivers an electronic time-table and shows the next and current lesson with room information. After the school day, a packing list for the next instruction day will be shown. If you want to know more about me, please take a look at the page about me.